85 Russia, Grand Russian Railway Co., 3% bonds for 125 roubles (metallic), third issue 1881, ornate border with city and industrial views, black on green paper, with talons. Some creased otherwise GVF. (30). 87 Russia, The Russian South-Eastern Railway Co. £100 bond of 1914, blue with coupons. GVF. (21). 1 Anglo-Russian Cotton Factories second charge debenture certificates for £100 dated 1897, pink & black (3). 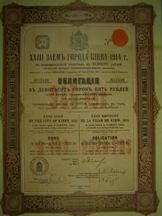 Great Britain, Purnell and Sons Ltd. ordinary share certificate 1935. GVF (4). 76 Russia (8) Russian State War Loan Bond 1916 for 100r, green. 1919 State bond for 5,00r. Russian State "Rente" Bonds1924 (6) for 100, 200, 500, 1,000, 5,000 & 2500 r, all with coupons attached. VF. 77 Russia, (15) Russia, 8 City bonds, Moscow 1908 Loan, bond for £20, Moscow 1912 Loan, 4 x bonds for £20, St-Petersburg 1913 Loan, 3 x bonds for £100, all with coupons and 7 Railway bonds, Armavir-Touapse 1909 Loan, bonds for £20 and £100, Russian South-Eastern 1914 Loan, 2 x bonds for £20, Kokand-Namangan 1910 Loan, bond for £20, and Troitzk 1910 Loan, 2 x bonds for £20, all with coupons, mostly F to VF. (15). 81 U.S.A. (6), Alaska Mexican Gold Mining Co. 1908 with coupons, British Bute Mining Co. 1901, Magma Copper Company 1925, New York, Chicago and St Louis Railroad Co. 1956, Western Maryland Railway Co. 1956 & 1959. GVF, some with punch cancellation holes. Together with a Russian Gold Loan of 1891 for 500 francs, no coupons remain. (7). 82 Russia, 8 railway bonds, Warsaw-Vienna 1890 loan, bonds for 125 and 625 roubles, Transcaucasian 1882 Loan, bonds for 125 and 625 roubles, Moscow-Smolensk 1869 Loan, bonds for 200 and 500 thalers, Grand Russian 1861 Loan, bond for 50 francs, also Nord-Donetz 1914 Loan, titre provisoire d'une obligation, all with coupons, mostly VF. (8). 87 Russia, Russian South-Eastern Railway 1914 Loan, bonds for £20, £100 and £500, ornate border, brown, blue and red respectively, all with coupons, the £500 bond has some damage to right and bottom margins, does not affect print, F-VF. (3). 80 Russia, 8 bonds, Russian Gold Loan of 1896, bond for 4,687.50 roubles, (poor), Russian Consolidated Rente 1901 issue, series 6, bond for 500 francs, series 16, bond for 500 francs, series 37, bond for 2,500 francs, series 49, bond for 500 francs, State Loan of 1909, bond for 500 francs, and Chemins de Fer Secondaires en Russe 1913 Loan, 2 x bonds for 500 francs, with coupons, mostly VF. (8). 79 Russia, 7 railway bonds, Troitzk 1910 Loan, bond for £20, Russian South-Eastern 1914 Loan, bonds for £20 and £100, Wolmar 1910 Loan, bond for £20, Kokand-Namangan 1910 Loan, bond for £20, Armavir-Touapse 1909 Loan, bond for £100, and Nicolas 1867 Loan, bond for £20, all with coupons, mostly VF. (7). 23 China, Chinese Government 1913 Reorganisation Gold Loan, 3 bonds for £20 Russian issue, vignettes of Mercury and Chinese scenes, black & green with coupons. (3). 21 China, Chinese Government 1913 Reorganisation Gold Loan, 3 bonds for £20 Russian issue, vignettes of Mercury and Chinese scenes, black & green with coupons. (3). 22 China, Chinese Government 1913 Reorganisation Gold Loan, 3 bonds for £20 Russian issue, vignettes of Mercury and Chinese scenes, black & green with coupons. (3). 20 China, Chinese Government 1913 Reorganisation Gold Loan, 3 bonds for £20 Russian issue, vignettes of Mercury and Chinese scenes, black & green with coupons. (3). 109 Russia, Russian State Loan of 1902, bonds for 500, 1,000, 2,000 and 5,000 marks, ornate border, various colours, all with coupons, mostly VF. 112 Russian Tobacco Company, bearer share warrants for, 1, 5, 10, 25, 50, and 100 shares, 1915, vignette of allegorical female and tobacco field, various colours, all with coupons, F-VF. (6). 108 Russia, Russian Collieries Co. Ltd., share certificate, 1903, very ornate Waterlow printed design, red, VF. (1). 84 Russia, Imperial Russian Government loan of 1916, bond for U.S. $1,000, vignette of two allegorical females with Czarist Russian coat of arms, printed by American Bank Note Co., black & green, with coupons, VF. (1). 83 Russia, Imperial Russian Government 5% Internal War Loan, collection of seven bonds, 1914 issue, bonds for 100, 200, 2 x 500 and 1,000 roubles, 1915 issue 2 x 100 roubles, all with vignette of woman with shield with Imperial double eagle and weapons, text in Russian and French, various colours, all with coupons, mostly VF. (7). 86 Russia, Russian 1909 State Loan, 5 x bonds for 2,500 francs, ornate design, blue, all with coupons, folded, otherwise VF. (5). 91 Russia, Russian Tobacco Company, set of six bearer share warrants, for 1, 5, 10, 25, 50, and 100 shares, 1915-16, very attractive Waterlow printed certificates with vignette of allegorical female in tobacco field, various colours, all with coupons, all VF. (6). 64 Russia, 7 railway bonds, Russian South-Eastern Railway, 1914, bonds for £20 and 2 x £100, Wolmar Railway, 1910, bond for £20, Kahetian Railway, 1912, bond for £20, Troitzk Railway, 1913, bond for £100, and Société des Embranchements de Chemins de Fer, 1913, bond for 500 francs, all with coupons, mostly VF. (7). 97 Russia, Russian Royal Loan of 1791, Dutch receipt for 1,000 florins, Amsterdam 1798, black, in excellent condition. AEF. (1). 120 Collection, 22 European bonds and certificates, dated 1900-50, titles include, Russian Bank for Foreign Trade, 1911, Imobiliara S.A. Romana, 1906, Etablissements Industriels de Berdiansk, 1900, La Pelleterie Russo-Americane, 1926, Petroles de Tcheecoslovaquie, 1930, a little duplication, mostly VF. (22). 69 Russia (9), Imperial Russian Government £20 bond 1894, no coupons. Black Sea Kuban Railway bonds 1911, £20 & £100 with coupons. City of Kieff Loan 1914 bonds £20 (5) & £100 (1). Generally about VF or better, Two with signs of having been framed. 67 Russia, Imperial Russian Government 1922 ‘Rothschild‘ Loan, bond for £148 or 960 roubles, signed by Nathan Meyer Rothschild as contractor in top right margin, double headed eagle at top, black on poor quality paper, weakness at folds, with talon, F. (1). 66 Russia, Imperial Russian Government 1922 ‘Rothschild‘ Loan, bond for £111 or 720 roubles, signed by Nathan Meyer Rothschild as contractor in top right margin, double headed eagle at top, black on poor quality paper, repair to weakness at folds, with talon, F. (1). 82 Russia, Grand Russian Railway, 8 bonds, 1859 Loan, bond for 500 silver roubles, 1861 Loan, bond for £20, 1881 Loan, bonds for 2 x 125 roubles and 2 x 625 roubles, these all have ornate border depicting trains, trees, and allegorical figures, also 1888 Loan, bond for 625 roubles, and 1890 Loan bond for 625 roubles, most with coupons, F-VF. (8). 5 China, 28 bonds, Province of Petchili 1913 Loan, 2 x bonds for £20, Boxer Loan of 1925, bond for $50, Lung-Tsing-U-Hai Railway, Loans of 1920, 1921 and 1923, 3 x bonds for 500 francs, Lottery Loans of 1926/27, three types, 22 bonds, lot also includes Russian State Loan of 1893, bond for 2500 francs, mostly VF. (29). 82 Russia, Russian 1822 Rothschild Loan, bond No.21549 for £148 or 960 roubles, double headed eagle at top, hand signed by Nathan Meyer Rothschild as contractor in margin, black, with talon, usual weakness at folds, F. (1). 134 Russia, City of Kieff, 23rd Loan dated 1914, bond for £100, ornate design with coat of arms at top, black & red on pink, with coupons, the 23rd issue bonds are scarce, this example has a Russian printed revenue stamp and a UK imprinted stamp, which appears to have been cancelled by the UK stamping office, neat repair to small split at central fold, otherwise VF. (1). 126 Russia, 8 bonds, Imperial Russian 3% 1859 Loan, 3 x bonds for £100, text in English on face and Russian on reverse, with coupons, Russian State Loan of 1902, bond for 1,000 marks, Chemins de Fer Secondaires, 1913 Loan, bond for 187.50 roubles, Nord-Donetz Railway, 1914 Loan, provisional bond for 500 francs, Embranchements de Chemins de Fer, 1913 Loan, bond for 187.50 roubles, no coupons, and City of Riga 1913 Loan, bond for £20, coat of arms at top, very poor condition, others F-VF. (8). 29 China, Chinese Government 1913 Reorganisation Gold Loan, bond for 189.40 roubles, Russian issue, with small square revenue stamp, vignettes of Mercury and Chinese scenes, black & brown, with coupons, VF. (1). 147 Russia, Russian 1822 Rothschild Loan, bond No.3341 for £111 or 720 roubles, double headed eagle at top, hand signed by Nathan Meyer Rothschild in margin as contractor, black, with talon, usual weakness at folds, however in better condition than that usually seen for this issue, about AVF. (1). 146 Russia, Russian 1822 Rothschild Loan, bond No.15797 for £148 or 960 roubles, double headed eagle at top, hand signed by Nathan Meyer Rothschild in margin as contractor, black, no coupons remain, usual weakness at folds, AVF. (1). 142 Russia, Imperial Russian Cotton & Jute Factory Ltd., 7 x bearer certificates, 1889-1902, all different, either denomination or capital, very ornate, text in English and French, various colours, all with UK revenue stamps, all with coupons, all VF. (7). 19 China, Chinese Government 1913 Reorganisation Gold Loan, bond for 189.40 roubles, Russian issue, with small square revenue stamp, vignettes of Mercury and Chinese scenes, black & brown, with coupons, VF. (1). 115 Russia, 15 State and railway bonds, dated 1859-1917, titles include, Grand Russian Railway, 2 x bonds, both 1859, Chemin de Fer de Boukhara, bond for 500 francs, 1914, Gold Loan of 1896, bond for 2,500 francs, State Loan of 1905, bonds for 1,000 marks and 2,000 marks, Gold Loan of 1894, bonds for 500 francs and 2,500 francs, Freedom Loan of 1917, bond for 1,000 roubles, most with coupons, F-VF. (15). 114 Russia, 13 Russian State Loans, 1894 bond for 2,500 francs, 1896 bonds for 500 francs and 2,500 francs, 1898 Conversion bond for 750 roubles, 1902 bonds for 1,000 marks and 2,000 marks, 1906 bond for 500 francs, and 1909 6 x bonds for 500 francs, most with coupons, the 1909 bonds are poor, rest mostly VF. (13). 50 Collection, 5 bonds, Chinese Government 1912 Gold Loan, bond for £20, Lung-Tsing-U-Hai Railway 1925 Loan, bond for 500 francs, Tientsin Pukow Railway, German 1908 issue, bond for £100, Russian Riga Dvinsk Railway 1894 Loan, bond for 125 roubles, and Nicholas Railroad 1867 Loan, bond for £20, the first two with coupons, mostly VF. (5). 46 Collection, 20 bonds and certificates, dated 1854-1975, titles include, Dominion Stores Ltd., 4 x certificates, 3 types 1929-32, Seaboard Cotton Compress Co. 1889, Chicago Cotton Manufacturing Co. unissued, Parker Pen Co. 1975, Egyptian Cotton Ginners & Exporters 1937, La Espana Industrial 1854, Imperial Russian Cotton & Jute Factory Ltd. 1888, Russian Troitzk Railway £20 bond, City of Moscow 1908 Loan £20 bond, mostly VF. (20). 120 Russia, 9 railway bonds, Consolidated 1880 issue, bonds for 125 roubles and 625 roubles, Nord Donetz 1908 Loan, bond for 500 francs, Black-Sea-Kuban 1911 Loan, bond for £20, Grand Russian 1861 issue, bond for £20, 1881 issue, bonds for £20 and £100, Nicolas 1867 Loan, bond for £20, and 1869 Loan, bond for £20, most with coupons, lot includes 4 Russian bank notes, F-VF. (9). 1186 Russia, Imperial Russian Cotton & Jute Factory Ltd., 7 x bearer certificates, 1889-1902, all different, either denomination or capital, very ornate, text in English and French, various colours, all with UK revenue stamps, all with coupons, all VF. (7). 1187 Russia, Russian South-Eastern Railway 1914 Loan, 4 x bonds for £100, ornate border, blue, all with coupons, very small piece missing from top right edge, otherwise AVF. (4). 1178 Russia, 7 bonds and certificates, Eclairage Electrique de St. Petersbourg, 3 x certificates, 1897-1903, different types, all with large vignette of river scene, different colours, Tramways et Eclairage Electriques de Simferopol, bond, 1911, vignette of tram, Russian General Oil Corporation, certificate for 5 shares, 1913, vignette of female, and Tramways et Entreprises Electriques de la Banlieue de St. Petersbourg, 2 x certificates, different types, both with vignette of allegorical figure, all pieces with coupons, mostly VF. (7). 1190 Russia, State Perpetual Loan, Dutch certificate for 1,000 roubles, dated Amsterdam 1824, issued by Van Vloten & De Gyselaar and others in exchange for the original Russian certificates, black, with coupons, VF. (1).